A Midwestern icon, the Juicy Lucy Burger is perfect for your 4th of July cookout. 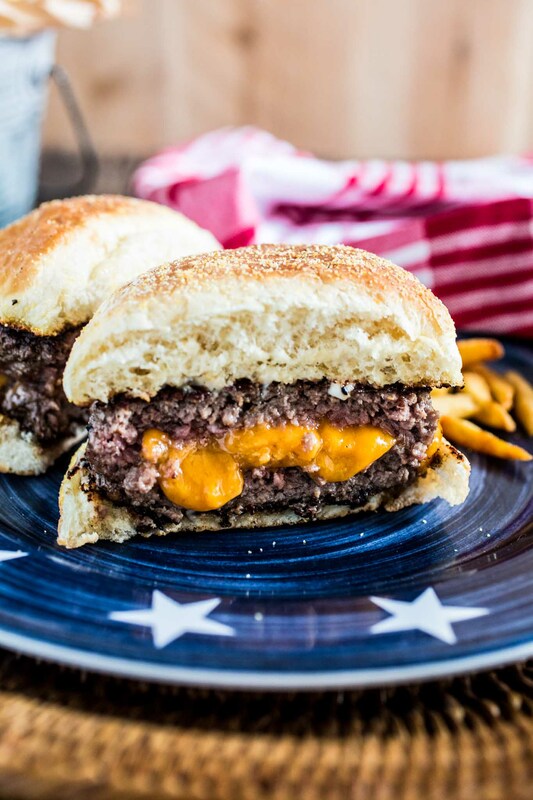 Because nothing is more American than a cheese stuffed juicy hamburger! As I sit at my desk, staring at the blank white screen filled with photos but no words, I start to realize that I should have eaten lunch before attempting to write this post. The pictures are just too tempting and they remind me how insanely delicious this burger was last night. Thankfully, I still have the ingredients to make one or two more. I guess I should go make one then, right? So, if you’ll excuse me, I will be right back! I’m back! All is good now. I’m fed, happy and ready to tell you all about this amazing burger. I did stop to watch Youtube videos and read the news, hence why it took me so long to come back. Yes, I am aware that I’m easily distracted. And that that has been my biggest struggle now that I’m blogging full time. In my defense, nobody told me that being a full time blogger was this hard. Somehow, in my mind, I pictured myself waking up every day at 6am, meditating, exercising, making/shooting 2-3 recipes a day while keeping an immaculate home, a healthy diet and being all done with the blog’s work by 6pm, when my husband gets home, so we could enjoy some time together. Ha! I wanna burst into hysterical laughter right now. The struggle is real, my friends. The Juicy Lucy Burger you’re seeing on the blog today, was made, shot and eaten yesterday! So much for being on top of things… Oh well, living and learning, right? Hopefully, I will get more organized and will eventually become this Martha Stewart-like-woman that I’m so desperate to be! ??? But you know what is great about this new life? For the first time in 5 years, I’m gonna have a holiday weekend! No more bartending weekends and holidays, which means enjoying myself and my family and possibly seeing some fireworks. Oh yeah, I am finally going to be able to properly celebrate 4th of July! And it’s going to be legendary. Just like this Juicy Lucy Burger! 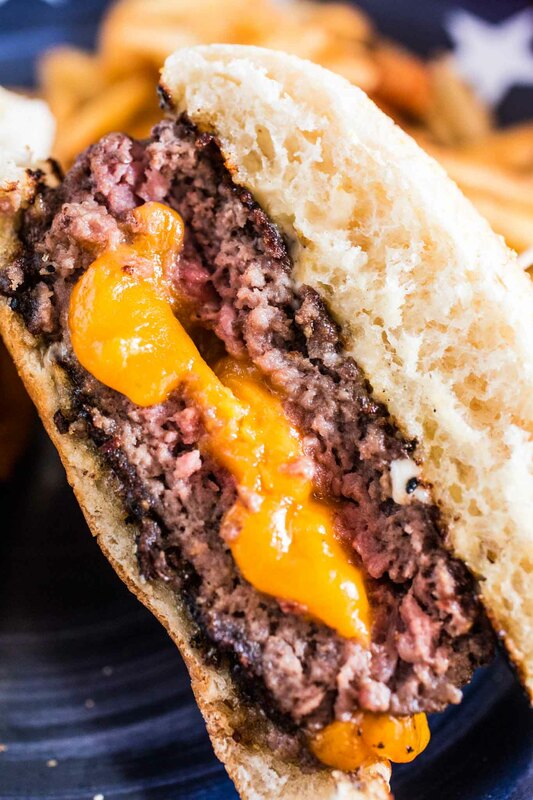 The signature burger of Minneapolis, the Juicy Lucy, is a cheeseburger with a twist: instead of the cheese being on top of the burger, it is sealed inside the patty! 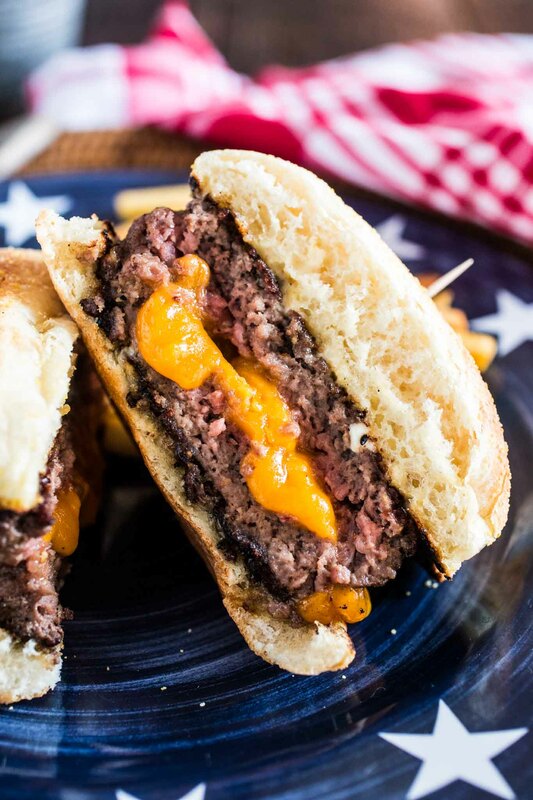 The trick here is to cook your burgers long enough for the cheese to melt. This is not a problem for me, since I like my burgers cooked medium, but if you’re a medium-rare or rare kinda gal (or guy), I’d say the Juicy Lucy is not for you! 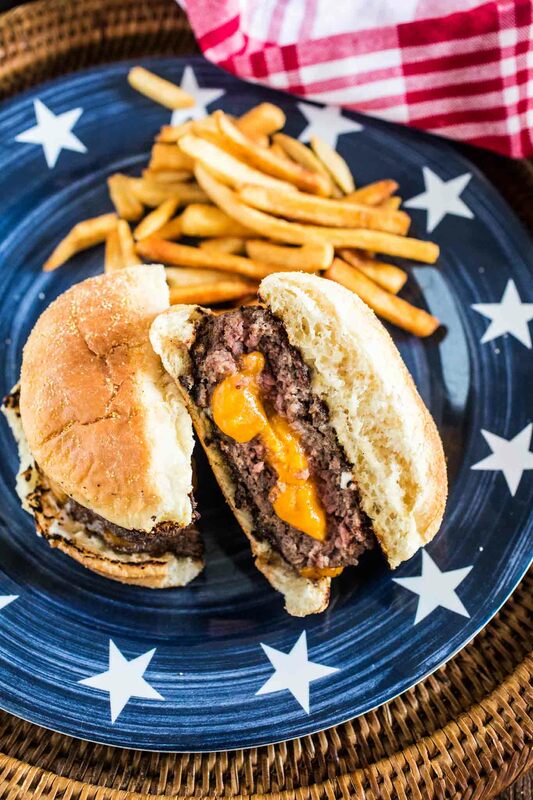 As for the cheese, the Juicy Lucy Burger is originally made with American cheese. 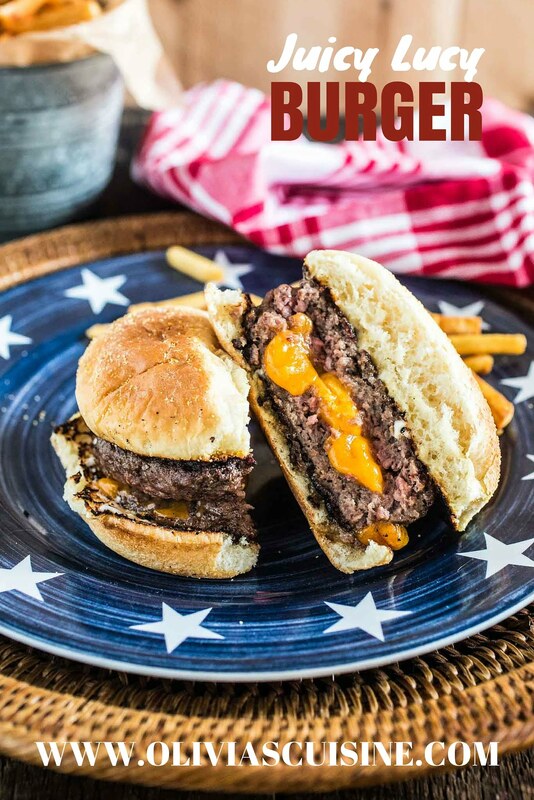 I know it’s 4th of July and all, but I simply can’t get behind American cheese, so I used extra sharp cheddar instead and it worked perfectly! In fact, any cheese that melts easily will do fine. Man, just look at that gooey mess of molten cheese. Doesn’t that make you feel all warm and fuzzy inside? ??? I seriously wanna hug whoever had the idea of stuffing cheese inside the patty. Which leads me to this curious fact: There are two bars – Matt’s Bar and the 5-8 club – that claim to have invented this burger. The rivalry between them and their interpretations of this burger is longstanding, but has gained more exposure since receiving a mention in Time in 2008 and being feature on some food-related television shows. I honestly have no opinion on the matter and, if I’m ever in Minneapolis, I’ll make sure to visit both places so I can be fair and give you a honest review! In the mean time, I’m happy with my own homemade Juicy Lucy Burger, which I highly recommend you make. After all, ’tis the week of celebrating all things American! Place the ground beef in a large bowl and season with the Worcestershire sauce, salt and pepper. Mix until well combined. Divide the meat into 4 equal portions and form each into a ball. Using your fingertips, flatten them into thin patties, about 1/4 inch thick. Divide the cheese into 2 of the patties and top them with the remaining 2 patties, pinching the edges to form a tight seal. With your hands, smooth out the edges and press on the top to flatten slightly into a thick single patty. Heat your grill or cast iron pan to medium high. Add a little vegetable oil and then add your burgers, cooking undisturbed for 5-6 minutes per side. Messing with them too much might cause the cheese to leak from the patty. Remove to a plate or cutting board and let the burgers rest for at least 3 minutes. Spread your toasted buns with mayo and place a patty on each bun bottom, topping with ketchup and covering with the bun tops. It can’t look better than this! I am already drooling! I had one of these for the first time on my trip to the US last year and it was AMAZING! I need to make myself one of these. That looks a great burger, full of quality ingredients. They do the best burgers in the US I think unless you make them yourself.